FIELDING GRADUATE UNIVERSITY 45 YEARS OF EDUCATING SCHOLARS, LEADERS, AND PRACTITIONERS. Our faculty members have diverse interests and backgrounds and are available to collaborate with students in courses and on dissertations that advance work important to the individual student. Creating a positive impact is what Fielding Graduate University’s School of Leadership Studies (SLS) is all about. Our Programs are designed for the professional who encounters the challenges in today’s education systems and workplaces and is inspired to address them. Having a local cohort of fellow students to support me through a doctoral program was the determining factor in selecting Fielding. Students in the Doctor of Education (EdD) Program transform their personal and professional lives through: intellectually rigorous academics; work with supportive, mentoring faculty; and participating in a learning environment that integrates with their life experiences. Energized by the freedom and encouragement to explore interests they care deeply about, our students move beyond knowledge consumption to become knowledge and effective practice producers. The EdD Program focuses on leadership for positive change in K-12 schools, community colleges, universities, communities, and organizations. Teachers, administrators, leaders, innovators, activists, and advocates develop new skills and profound insights from doctoral-level study. They learn to embrace challenges and create impactful solutions. They become even more effective change agents. Our students and graduates are lifelong learners who participate in action research, pushing the boundaries in their workplaces, schools, and communities. Faculty and students alike are scholar-practitioners, striving to transform systems to be more just, equitable, and sustainable. As innovators in adult education, we take concepts of developmental learning and apply them in our mentoring and advising relationships with students. We forge new ways to help students connect with what they already know, what they need to know, and how to get there. From our online library to our student advising, tuition, financial aid, registrar and help-desk support areas, Fielding staff strive to make our support services to students useful and timely. Accommodations for students with disabilities and study aids for all students are available. A mainstay of our learning ideology from the founding of Fielding, has been in-person sessions for students and faculty held throughout the US and globally. These are an important way we connect and re-connect within and across our disciplines. BECOME a CATALYST for POSITIVE CHANGE. Become a catalyst for positive change in your school, organization, or community. 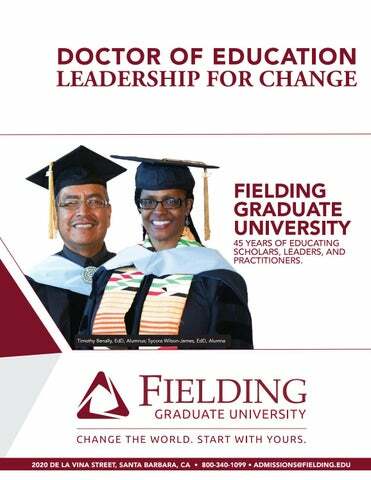 Fielding’s Doctor of Education (EdD) degree is designed for professionals who are inspired to tackle the challenges in today’s educational and human services systems, organizations and communities. Our unique learning model blends online and in-person learning designed for working professionals to pursue a degree in ways that best fit with career and family responsibilities. A multi-day orientation is the only residency requirement of the program. Through action-oriented research, students systematically analyze, evaluate, and improve educational processes and practices. Students in the EdD program are empowered and equipped to lead positive, systemic change in their communities. PROGRAM BENEFITS §§ Intellectual Power. Our EdD degree offers supportive, mentoring faculty who help students integrate their life experiences with rigorous academics. §§ Individualized, Participatory Learning. Our faculty are accomplished and collaborative, and continuously and actively engage with each student and his or her unique learning plan. §§ Collaborative, Transcultural Community. A blended learning model–including synchronous face-to-face and flexible, online learning opportunities–allows students to engage in a global, interactive network. §§ Inspired Activists. Teachers, administrators, leaders, innovators, activists, and advocates develop new skills and profound insights from doctorallevel study. §§ Meaningful Impact. Customize your studies to focus on your interests. TUITION & FEES $8,740/term Further details may be found at catalog.fielding.edu Tuition and fees are subject to annual revision. WE’RE HERE TO HELP. WAYS TO FIND OUT MORE. CREATIVE LONGEVITY AND WISDOM provides a focus on aging populations locally, nationally, regionally, and globally. Promote barrier-free, sustainable, and nurturing environments and foster active and wise aging populations that will promote greater social and ecological justice for diverse populations worldwide. CUSTOMIZE YOUR DEGREE EVIDENCE BASED COACHING offers an interdisciplinary approach to integrating research-based coaching theory with professional practice in organizational and individual coaching. Participants will study the core theories that underpin principle practices of individual and organizational coaching and undertake individual research to integrate theory with practice in individual and organizational settings. LEADERSHIP OF HIGHER EDUCATION SYSTEMS focuses your doctoral study on the knowledge and skills you need to become a leader and change agent in higher education institutions, such as 4-year colleges, universities, and graduate schools. MEDIA, TECHNOLOGY, AND INNOVATION focuses on the ways in which media, information, and knowledge are transforming our societies, cultures, organizations, and our own selves. Learn to live in an online world through virtual teams and explore topics such as social justice and ethics. ORGANIZATIONAL DEVELOPMENT focuses on theoretical knowledge and practical skills that will allow you to lead change in the workplace. Learn how to engage in online environments and collaborate with other management and consulting leaders. SUSTAINABIILITY LEADERSHIP produces leaders in businesses, nonprofits, governments, and educational institutions. This concentration includes study of the history and practice of sustainability efforts, organization development for sustainability, and strategy development for sustainability. FREQUENTLY ASKED QUESTIONS Q: What is the difference between an EdD and a PhD? A: The EdD program is the only professional doctorate offered at Fielding Graduate University. Q: Will I have the opportunity to practice leadership for change? This degree is also useful for those persons in the business world who are responsible for improving organizations through teaching and learning. In the EdD program, theory is used primarily to inform and improve practice. In a PhD program, the emphasis is on generating new theory. A: Yes, as part of your required Leadership for Change Praxis (12 credits), students have the opportunity to find internships or work in their community or other communities of practice. Student work is guided by a customized Learning Plan and a Personal Praxis Plan. You are encouraged and supported in thinking about and working on your dissertation right away. Faculty mentors are committed to working with you until you complete the degree. EdD students may also structure their elective choices to fulfill an optional EdD concentration. Q: How can I limit my tuition costs? A: The only residency requirement is the New Student Orientation (NSO) which lasts approximately 4 days. The January and May NSOs take place in Santa Barbara, CA. The September NSO takes place in the Washington D.C. area. A: Tuition is charged by the term and not by the credit hour, so students can take advantage of those times in the year when they are more available to complete coursework. EdD doctoral students who are nearing the completion of their programs are eligible for advancement to candidacy status, which grants a 30% reduction in tuition. And all students are eligible for up to 12 months of leave over the course of their enrollment (although such leave may extend time to degree). Visit Tuition at www.Fielding.edu/tuition & Financial Aid at www.Fielding.edu/finaid for more financial planning tips. The program prepares scholar-practitioners for leadership roles in education, government, nonprofits, and communities. Q: Is the EdD program accredited? A: Fielding Graduate University is accredited by the Western Association of Schools and Colleges (WASC), and has been since 1982. A: The average age is 50 years old. We have students in their late 20’s and also in their 80’s. Q: How many hours per week does one spend on their coursework on average per class? A: Students who enroll in 10 credits a term spend an average of 32 hours a week on their studies depending on the nature of the specific coursework. the university with the degree? A: Fielding’s Common Doctoral Framework enables you to create a pathway to degree completion in 3 years. Q: Who are the faculty members for the EdD in Leadership for Change program? A: All faculty in the program hold advanced degrees. They are each committed to applying their expertise and experience to the achievement of student goals. 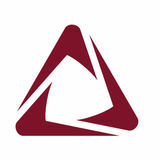 Visit Fielding.edu/EdDFaculty to learn more about our dedicated and professional faculty. Q: How am I assigned a faculty mentor? A: You can choose your own faculty mentor from a list of available faculty. You may want to choose a mentor who lives close to you and or whose interest and experience fits your own. You can also change mentors as you go through the program if you determine someone else is a better fit for your needs at that point. match his or her research interests with those of the professor or is the range of research interests of graduate students wide in scope? presentations, discussion forums)? Are there a lot of group projects or are there more individual projects than group projects? A: Students determine their dissertation topics based on their own personal passions. Our faculty is committed to helping students reach their individual dissertation goals. A: Coursework is completed through online, virtual, and/or in-person activities depending on the course. Most online work is asynchronous and involves one or more of the following: writing papers, discussion posts, responding to other students papers or posts, doing an online presentation, or discussion via Zoom synchronous meetings. In some classes, students work in small groups. The course syllabus, available before registration, outlines course delivery methods and expectations. A: There is a wide variety of pre-approved concentrations available to choose from. The concentrations and courses available are taken as part of your elective options. You can begin working on your dissertation from day one if you already have a strong sense of the dissertation research and or concentration you want to choose, by focusing your praxis and research during core courses. Q: Does adding a concentration extend the number of years to completion? A: While it does not need to extend time in the program, it may do so for some students who need to complete courses beyond the required number of electives. Q: What kind of job opportunities are there for graduates with an EdD in Leadership for Change? A: The EdD prepares you for a variety of careers. Some students stay in their current work settings and change their roles; others may move to administration, student affairs, assessment of student learning, and or develop independent practices. Q: Are there any supplemental services available to students? A: Yes, there are several supplemental services Fielding’s Graduate students can utilize: Disability Services, Student Accounts, Library Services, Office of the Registrar, Student Advising, Financial Aid, Scholarships, and Information Technology Services. A: Yes, most Fielding students published their dissertations ‘Open Access’ making them freely available to researchers on the web. Critical Reading and Writing is the first of three courses in the Effective Communications area. This course builds on your powers of observation, discernment, and intuition as existing competencies that can be used to help build bridges to new competencies necessary to your Fielding journey. YOUR COURSEWORK APPROACHES TO INQUIRY COURSES (16 CREDITS) Provide a solid foundation for your dissertation research, including action research methods: ELC-724 Systems Thinking 4 semester credits The Systems Thinking course is one of the four required courses in the Approaches to Inquiry Learning Area. Systems Thinking is the process of understanding how things influence each other within a whole. This definition allows us to see System Thinking as both a common-sense proposition that we all employ in our day-to-day lives, and it also suggests how Systems Thinking can help us understand and change complicated systems such as classrooms, schools, business, community, and political organizations. This course explores key Systems Thinking principles, approaches, and theorists. You will also be introduced to examples of how Systems Thinking has been applied by some organizations and individuals to make change. and unplanned activity. With this framework in mind, our focus will be to explore how change unfolds in a variety of institutional expressions like education, the media, community, and political organizations, as well as other behavior shaping institutions. Still within this framework, an organizing focus of our work together will be to explore the role of leadership in creating effective change. Delivery Method: Online ELC-727 Overview of Action Research Methods 4 semester credits Overview of Action Research Methods is one of the four courses in the Approaches to Inquiry Learning Area. This course is an introduction to the assumptions of qualitative, quantitative, and other research methods that are intended to support effective change. The overriding purpose of this course is to help you see relationships between the kind of research and/or change question you pose and the kind of method(s) you choose to answer that question and / or to arrive at a formula for change. Structural Inequality and Diversity (SID) is one of the four courses in the Approaches to Inquiry Learning Area. This course introduces you to various schools of thought on issues concerning race, ethnicity, gender, sexual orientation, physical ability, language, class, and other forms of difference that have been reified as structures of inequality. The focus of this course is on how systems of oppression have been created, how they work to be self-perpetuating, and how some members of historically marginalized groups have proposed ending structural inequalities. This part of the curriculum affords you the opportunity to extend and deepen involvement in one or more change efforts as well as reflecting upon your experiences more deeply so as to increase your effectiveness. You may do work which involves faceto-face work in a setting or in virtual communities. You may involve yourself in existing and ongoing projects or organize something new. You may wish to coordinate work for this course with elective or required courses or to align it with your dissertation plans. The projects in which you get involved are opportunities for you: to develop new skills, to deepen current skills, to test out theories which you are exploring, to develop new theories out of the experiences you are having, to collaborate with others within and outside of ELC and Fielding, and to make a difference in the environments that matter to you about the issues that concern you most. Provided that you have completed the Introductory Seminar, you may complete this work at any point in your program. This is a repeatable course. ELECTIVES (16 CREDITS): Choose any additional 16 credits from any electives in the School of Leadership Studies.